Rachel Meyer Yoga | Writer. Urban yogi. Cool chick. Laugh, sweat, and walk out feeling a little stronger, a little softer, and a lot more balanced. Words can make us feel less alone in those moments of our lives that feel the most mired in shadow. We lift up all that is good and holy and alive in the world when we sing, when we tap a foot, and when we rock out upside-down. Rachel Meyer is an American writer and yoga teacher based in Switzerland who believes in keeping things real. She draws extensively from her roots in musical theater, theology and the arts. 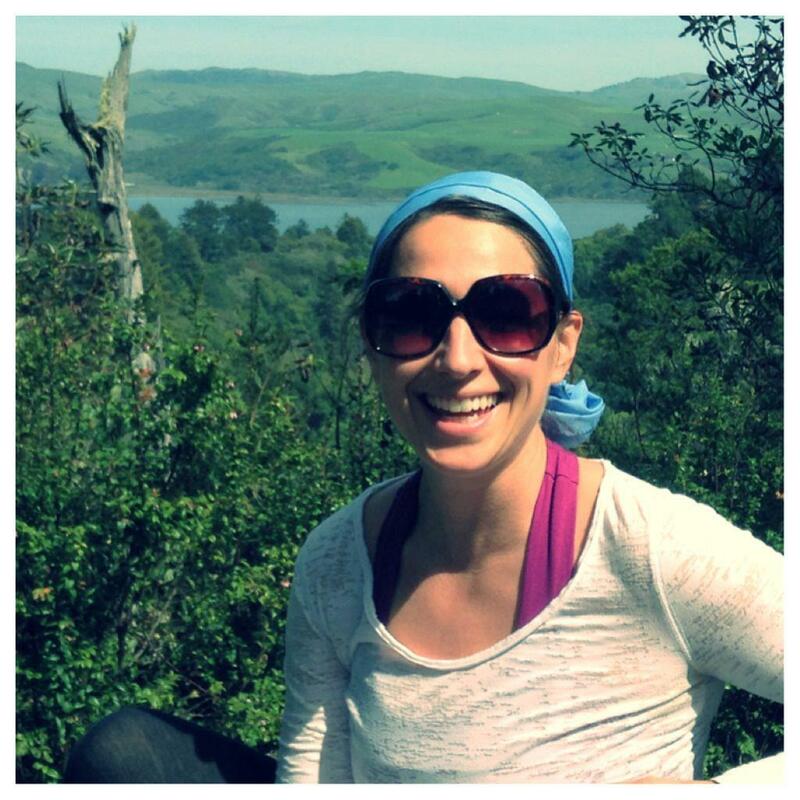 Rachel embraces both the rigorous academic world of yogic philosophy and the “real world” of asana, meditation and service. She’s an RYT who’s written for The Washington Post, Yoga Journal, On Being with Krista Tippett, Tricycle: The Buddhist Review, Yoga International, Parents, HuffPost, Quiet Revolution, YogaDork, and more; trained with and assisted Rusty Wells, MC Yogi, and Amanda Giacomini; taught extensively throughout the West Coast; and earned a Masters in Systematic Theology under groundbreaking radical theologian (and badass grandma) Rosemary Radford Ruether. Rachel grew up on the Great Plains, the daughter of a Lutheran pastor father and a music teacher mother. She spent a lot of time reading Little House on the Prairie and looking up at the big South Dakota sky. A few years, a degree in Sociology/Gender Studies, and an East Coast later, she thought she might like to spend her life tap dancing and belting out Gershwin showtunes in fishnets and bad wigs. She spent awhile in Scotland in her early twenties doing just that. That’s where, after years of hoofing it on wooden floors in awkward pink and black leotards, she discovered yoga. Several oceans and a few adventures later, Rachel found herself on the West Coast, where she was all set to spend her life being a professor of Marxist social theory and progressive embodiment theology. She wanted to shift American religious culture from one based in fear and sexual repression to one rooted in love and social justice. 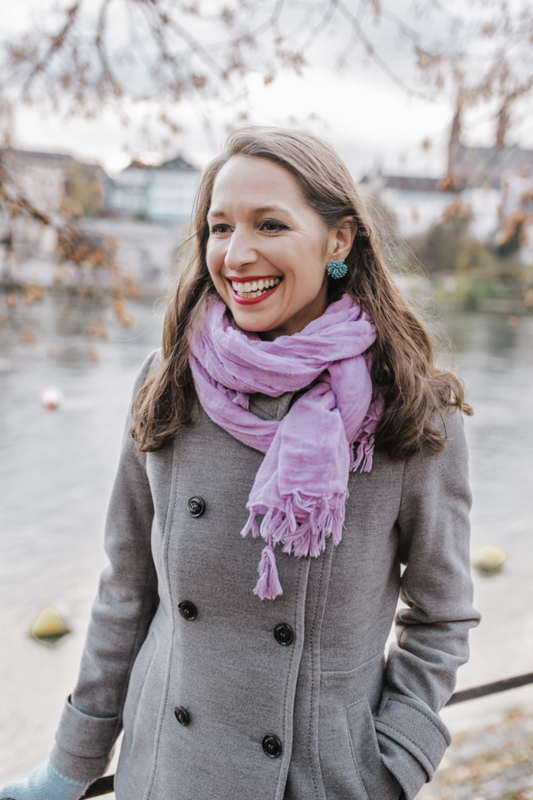 Rachel spent several years climbing Berkeley’s Holy Hill, reading Buddhist philosophy, practicing Bikram yoga, and soaking up esoteric French cultural theory on her way to a Masters in Systematic Theology. Then one Sunday morning in 2009, inspired by a colleague’s passing referral, Rachel discovered Bhakti Flow. She found therein a rare melding of all the best things in her life: spirit and athleticism and sweat and song and breath and service and theology and laughter and community and rhythm and dance. She knew immediately that she was in the right place. That year, Rachel completed a Certificate in Yoga Philosophy at the California Institute of Integral Studies, where she had the pleasure of learning from yoga luminaries Richard Rosen (history and pranayama), Carlos Pomeda (Upanishads and meditation), Gary Kraftsow (Viniyoga and classical theory), and Sally Kempton (Tantra); she then studied Patanjali’s Sutras with Chase Bossart and Kate Holcombe, completed her 200-hr Bhakti Flow training with Rusty Wells, assisted MC Yogi, and went on to teach at a variety of studios in San Francisco, Oakland, and Point Reyes. These days, having relocated to Basel, Switzerland after 15 unforgettable years in San Francisco, Portland, and Boston, Rachel teaches Ashtanga-inspired freestyle vinyasa and fumbles her way through the 7th Series yoga that is parenting an inquisitive preschooler. Her current style is influenced by the work of Larry Schultz (creator of The Rocket), Buddhist psychotherapist Michael Stone, and meditation teachers Sharon Salzberg, Ethan Nichtern, Jack Kornfield, and Tara Brach, among others. She bows in deep gratitude to the diverse teachers who’ve blessed her life to this point, and looks forward to meeting you on the mat to share her love for this luminous, life-changing practice. 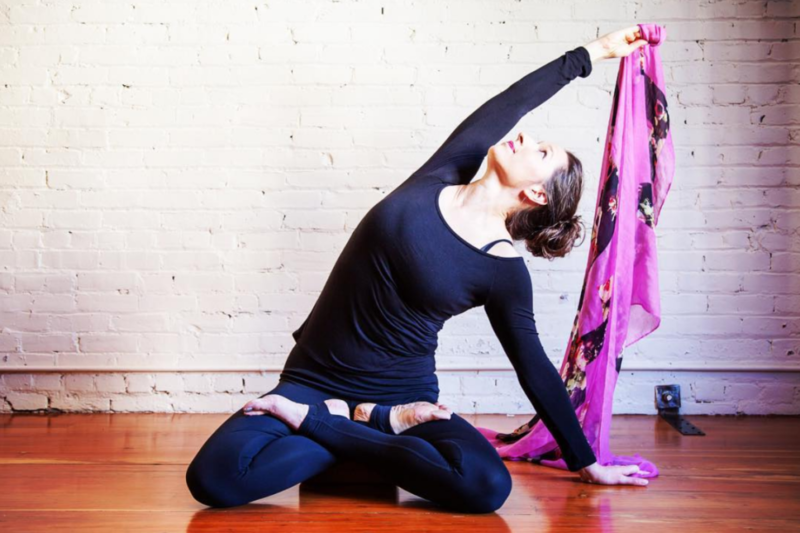 Rachel's vinyasa classes are a music-infused blend of athleticism, dance, and spirit. 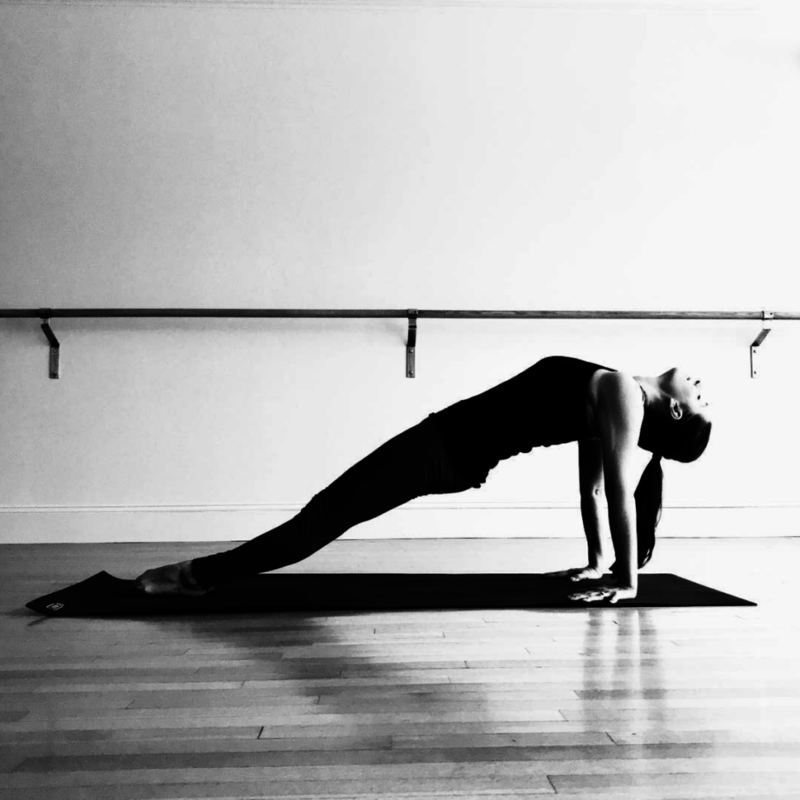 She crafts an intense flow-based practice rich in yoga philosophy, sweaty with hard work, and celebratory in tone. You can expect a fast Ashtanga-inspired pace, creative sequencing, advanced backbends, arm balances, inversions, and maybe a vertical split or two along the way. Rachel hopes you'll laugh as much as you sweat, and walk out feeling a little stronger, a little softer, and a lot more balanced. I’m delighted to serve on the faculty at B.Yoga Basel, a beautiful studio overlooking Basel’s famous medieval Rathaus. Join me for regular public classes Thursday evenings at 6:45pm. Keep an eye on Instagram and FB for additional teaching dates.